An unthinkable massacre ignites an intense national debate. Then, Congress does nothing. The powerful gun lobby wins again. End of story. So went the popular narrative last spring with the collapse of gun control legislation on Capitol Hill. Meanwhile, scores of people have been wounded or killed in five new mass shootings and other gun rampages around the country and an estimated 30,000 have been killed by firearms — including hundreds of young children, as documented in our latest investigation. But no, the gun lobby did not “win.” The real action after Newtown was not in the nation’s capital — it was in most statehouses around the country, where no fewer than 114 bills were signed into law, aiming in both political directions. America has warred over its deep-rooted gun culture on and off for decades, and Newtown set off a major mobilization on both sides. Determining how that battle changed the terrain in 2013 isn’t just a matter of the total number of laws passed (some of which contain multiple measures), but also the types of activity and swaths of population they affect. Unsurprisingly, the redder states mostly continued to deregulate firearms, while bluer coastal states — and a more politically split Colorado — moved aggressively to tighten restrictions. 41 new laws in 22 states made it harder for people to own guns, hard for people to carry them in public and enhanced the government’s ability to track guns. Additionally, 15 laws in 15 states made it harder for people with serious mental health problems to possess guns — a major factor in mass shootings, as our ongoing investigation has shown. Together, these laws affect more than 189 million people. 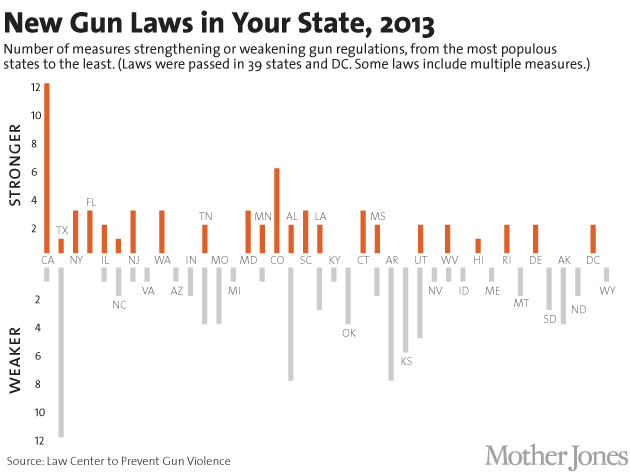 The most sweeping restrictions came in Colorado, Connecticut, Maryland and New York, including background checks for gun buyers and bans on assault weapons and high-capacity magazines. Although tracking gun ownership is anathema to the National Rifle Association and its allies, 18 states and the District of Columbia boosted their capabilities to do so: New measures included requiring lost or stolen firearms to be reported (Maryland, New York) and criminalizing the tampering with manufacturers’ identification marks on firearms (Rhode Island). From Florida to Colorado to Washington state, lawmakers required more rigorous reporting of mental health records to the FBI’s criminal background check system and imposed greater restrictions on the mentally ill.
75 laws in 29 states made it easier for people to own guns, carry guns in public places — including schools, churches, restaurants, bars and casinos — and made it harder for the government to track guns. Together, these laws affect more than 185 million people. As a recent New York Times interactive shows, the majority of laws deregulating guns were passed in states with Republican-controlled legislatures and governorships, while a majority of laws tightening restrictions passed in states where Democrats were in control. But several states in fact pulled the trigger in both directions. The Democratic-controlled statehouse in Minnesota, for example, was among those improving mental health reporting but also passed a measure curtailing data collection on individual gun ownership. New Jersey prohibited individuals named on the federal Terrorist Watchlist from purchasing a firearm but also made concealed-carry permit records confidential. Utah passed two measures aimed at halting domestic violence against women — a problem frighteningly exacerbated by lax firearms laws in some states — but also made it easier to carry a concealed gun on university campuses. Mark Follman is a senior editor at Mother Jones. He is a former editor of Salon and a cofounder of the MediaBugs project. His reporting and commentary have also appeared in Salon, Rolling Stone, The Atlantic, The Boston Globe, USA Today and on Fox News and NPR’s All Things Considered. The in-depth investigation into mass shootings he led for Mother Jones has been honored with multiple awards: The 2013 Izzy Award, two Society of Professional Journalists awards for reporting excellence and an Online Journalism Award.